From 'Kareena Pizza' to 'Deepika Dosa': Why our Bollywood is so delicious! The stars are always on a diet. But the industry is absolutely edible, it seems! 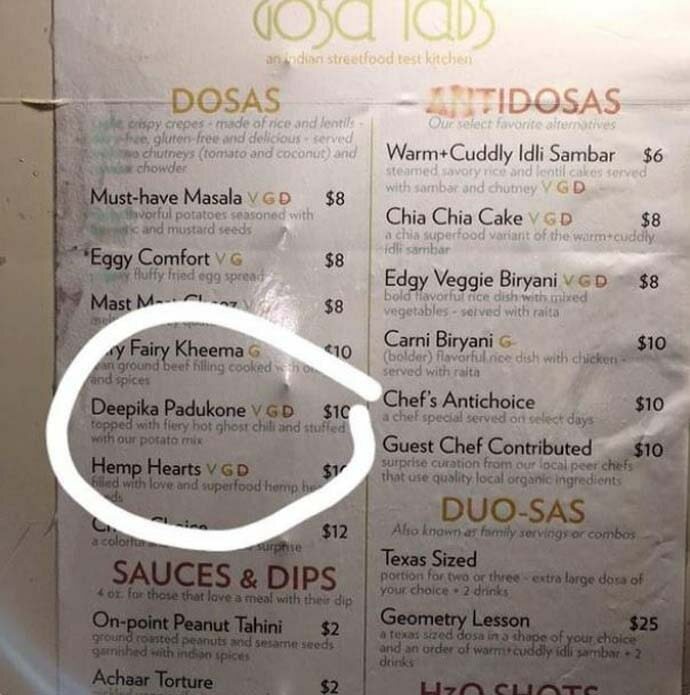 A food truck in Texas, USA, naming a dosa after Bollywood actor Deepika Padukone, may surprise those who are not quite aware of the popularity our film industry enjoys across the world — despite not having impressed its critics in 2018. Topped with fiery hot 'ghost chilli' and stuffed with a potato mix, we are sure the 'Deepika Dosa' is nothing like a normal dosa that Kannadas like Deepika might have encountered so far. But this 10-dollar-dish has already turned several heads on social media as Ranveer Singh has expressed his desire to taste this Deepika Dosa! The tryst between Bollywood and food is not a new one and, believe it or not, it has nothing to do with the box-office performance of the stars. No, nepotism doesn't rule here. Also, unlike in a Bollywood script, there’s no objectifying women here either. In various ways. It can be an actor's favourite dish at a particular eatery which he or she often orders, or maybe just a dish which they may have had during some shooting at a roadside dhaba, which they are not likely to revisit. But the legend of, say, a Ranbir Kapoor visiting a dhaba — where he sat, with he did, whom did he interact with, and of course, what he ate — will be not allowed to slip into oblivion as long as the storytellers are alive. Thus, a Pali Hill eatery named a three-tier chocolate cheesecake after actor Bobby Deol, because it was reportedly one of his favourites. It's quite obvious that many eateries of Mumbai have such 'fan moments' preserved as special dishes and recipes — 'Om Puri Ka Mutton Saagwala', 'Sanju baba Chicken', etc. So, Bollywood may be a tightrope commercial walk in which one may not quite remember Bobby Deol’s comeback in Race 3 — but it's ok as there is more than one way to be remembered. There were varieties of 'Bollywood milkshake, for instance — 'Mallika milkshake', 'Priyanka milkshake' — at Millions of Milkshake in West Hollywood, a milkshake bar specialising in celebrity shakes. It was closed in 2016 but the shakes thus named live on in afficionados' memory. When Kareena Kapoor stunned the world with her size-zero figure in Tashan, an Italian joint in Delhi came up with a 'Kareena Kapoor Size-Zero Pizza' — a thin crust pizza, topped with finely diced chicken, red chillies, baby corn, onions and low-fat cheese. Well, Kareena Kapoor likely didn't get her size-zero figure by savouring that pizza. But the things that Bollywood and a 'low-fat' tag can do! Magic! An eatery in Mumbai made a special blueberry cake for Sonam Kapoor on her 25th birthday and named it 'Sonam Special' — it was apparently made of oats, without any preservatives. Such a clever promotion trick! On second thoughts, this is actually a clever promotion trick where you don't have to pay the stars for any endorsement — because it's a tribute, right? The recent Deepika one clearly worked. The actress tweeted the menu from her social media account with much happiness — just imagine the free publicity the food truck got by doing nothing! 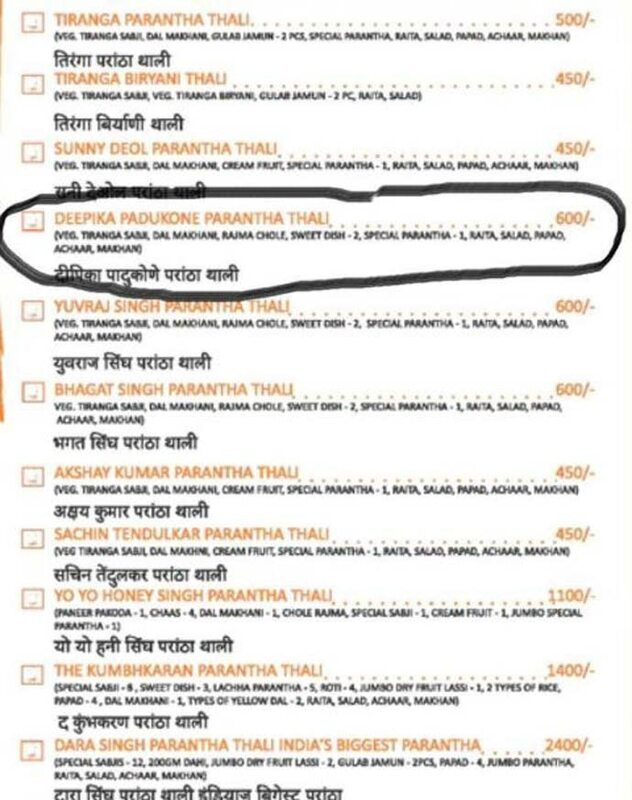 A Pune eatery came up with a 'Bahubali Thali' featuring Devasena Paratha, Katappa Biryani, Sivagami Shahi Pakwan, Bhalladeva Patiala Lassi et al. Apparently, five people can eat the thali which takes one solid hour to prepare. Menus change, eateries may get shut. But these inside stories remain — as a lip-smacking tribute to our perenially dieting stars!